As a Millennium Falcon focus collector, this picture should be something of an anathema to me. 🙂 It’s unusual enough though, so i thought i’d post it. I found this original watercolour painting picture on the Comic Art Fans web page. It belongs to Luis Fernandez Antelo and is part of his awesome original pictures of European and Argentinian art. 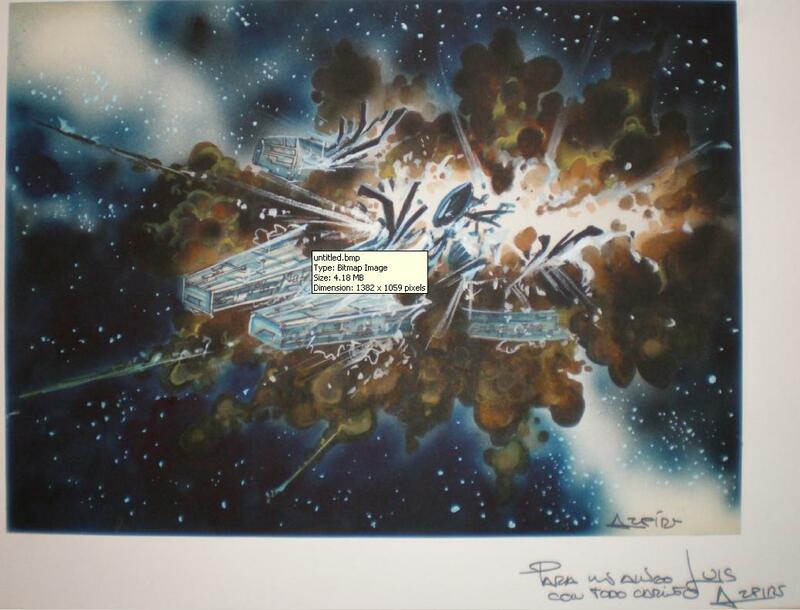 Created by Alfonso Azpiri and maybe the only published version ever of the Millennium Falcon’s destruction. It was published in Spain at the beginning of the eighties, as illustration for a choose your own adventure book. This entry was posted in Art, Things that i don't have yet... and tagged Alfonso Azpiri, Art, Millenium Falcon, Millennium Falcon, Star Wars. Bookmark the permalink.